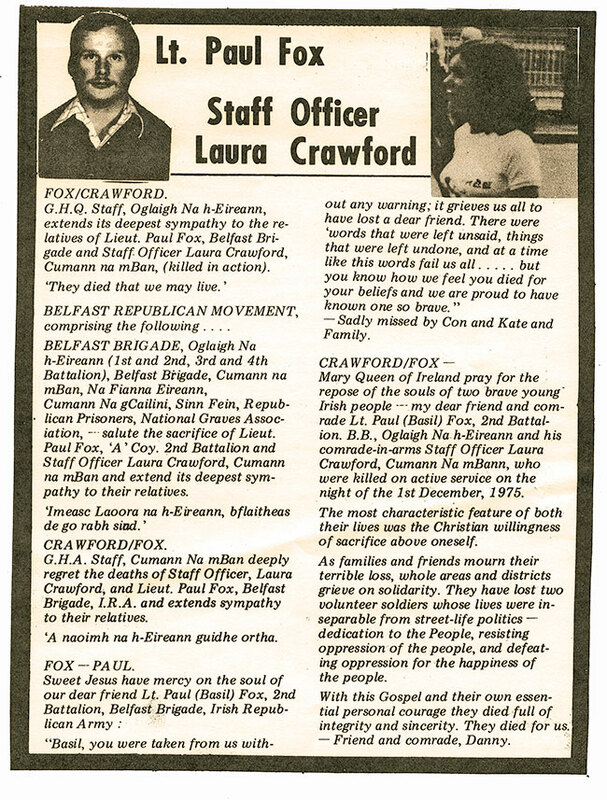 LAURA CRAWFORD AND PAUL FOX were killed on active service in Belfast on 1 December 1975. Danny Morrison – the novelist, former IRA prisoner and Editor of An Phoblacht/Republican News – was asked to speak at the commemoration for Laura at the Women’s Garden of Remembrance, Roddy McCorley Club, Glen Road, on 21 November 2015. We reproduce Danny’s tribute as it depicts the background to the conflict that these young republicans were thrust into and which cost their lives and of so many others. 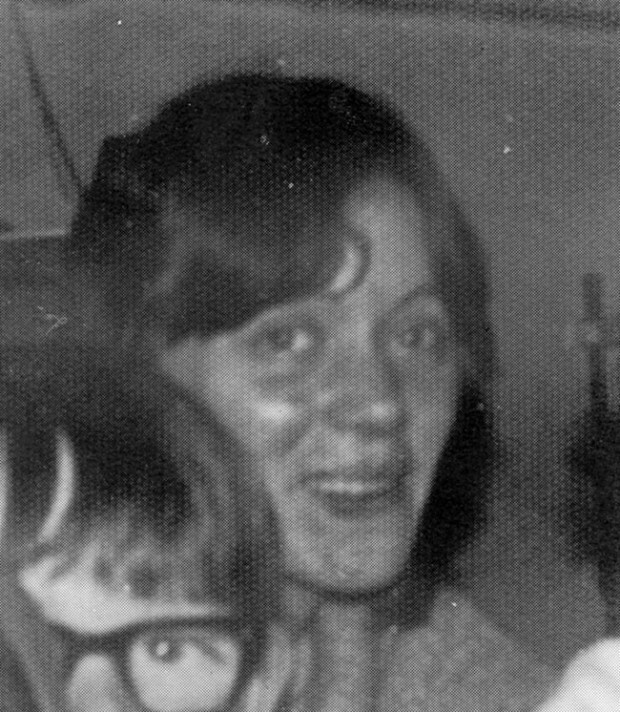 ALTHOUGH Laura and IRA Volunteer Paul Fox died on active service together on Monday 1 December 1975, the particular date for this commemoration was chosen by the family because yesterday, had she survived the war, the conflict, Laura would have been celebrating her 65th birthday. We can only imagine the great contribution she would have made to life, her family, her community and her country. Had Paul lived, he would have been 60. It is astonishing, it is unbelievable, to think about the passage of time that separate us from these loved ones, our flesh and blood. And it is impossible for me to imagine Paul ‘Basil’ Fox other than the teenage terrier that he was – ducking down alleyways, evading British Army patrols, being the bane in the lives of the King’s Own Scottish Borderers and the Royal Green Jackets. The Brits raided Paul’s home on his 17th birthday, hoping to intern him, but he escaped that raid, one of 89 raids the Fox family experienced on their home. Imagine – 89 raids on your home by the British Army; young ones terrified; rooms wrecked. The Green Jackets, on 13 November 1972, also tried to kill Paul. They opened fire on a car in which he was the passenger and they killed his comrade, IRA Volunteer Stan Carberry. Paul and I were arrested together at a dance in Clonard Hall in November 1972 and we were interned in Cage Two of Long Kesh together. I have written and spoken about Paul and our comradeship many times, but I think this is the first time that I have publicly spoken about Laura, whom I first met in late 1975, about a month before her death, and spent some time in her company. I want to describe what life was like for the nationalist community back then. We are a first-class people but we were born into a state whose government – to its detriment – treated us like second-class citizens. As soon as the Ulster Unionists took power, they redrew the electoral boundaries so as to render our votes as useless. They abolished proportional representation. They armed one section of the community with the Royal Ulster Constabulary and its reserves, the A-Specials, the B-Specials, the C-Specials,. They introduced the Special Powers Act. They used internment every decade to shut us up. They located most industries in unionist areas, which meant that the areas which suffered the highest unemployment and the lowest-paid were nationalist areas. Despite being an artificial minority, nationalists made up the majority of those who emigrated to get away from the Orange State. Those who left remembered those who stayed. Those who left became the financial and material support of our resistance when the time came to resume the struggle for freedom. Ned Crawford, a docker and trade union man from Ballymacarrett, and Bridget Brennan, from Balkan Street in the Falls, married in 1939, and went on to have eight girls and two boys whom they raised in a two-bedroom house in Frere Street, in the shadow of the mills, and in an area that had been attacked in the 1920s and the 1930s. Using the example of the black civil rights movement, our people marched peacefully for peaceful change and reform. They were beaten into the ground. When they got back up on their feet, they were shot and their homes were burnt to the ground. When they armed themselves – because, clearly, no one else was going to protect them – their homes were raided, their streets curfewed and they were gassed from the air by hovering British Army helicopters. Their homes were wrecked by the British Army, against whom – before the curfew – not one shot was fired, not one gun directed. These were the times Laura Crawford grew up in. So Laura experienced August 1969 from the frontline as hundreds of homes were burned down and thousands were made refugees and had to flee south. Fatalities on the night of 14 August 1969 included 9-year-old Patrick Rooney shot dead in his bedroom by the RUC; and Trooper Hugh McCabe, a British soldier home on leave, who was killed by the RUC as he tried to defend the people of Divis Flats. The Crawfords knew what it was like to be trapped in a curfew as the British Army raided the Falls, house-by-house, under the cover of CS gas and lethal gunfire, killing and wounding local people. The Falls area was being redeveloped and new estates were being built in the west of the city. The family moved into Rosapenna Square in Lenadoon. It was not long before Lenadoon was a battleground as the British Army raided homes on 9 August 1971 as internment was introduced. Then there followed, in January 1972, one of the most traumatic events up to that time in the experience of the nationalist community when British paratroopers shot dead 14 civil rights marchers in Derry. This had a profound effect on the community and many young people were to flock to the IRA, believing it was the only answer, the only response, to repression. Among those was Laura’s younger sister, Geraldine. Before long she was arrested, charged with possession of weapons and sentenced to eight years in jail, which to a 17-year-old teenager would have been a frightening prospect. Geraldine went to Armagh Jail, where earlier in the year Andersonstown woman Liz McKee had become the first woman interned since the 1940s. This was the background to Laura secretly making the decision to join the Republican Movement through Cumann na mBan – thousands of nationalists interned, prisoners tortured, daily raids and harassment. Her sister Brenda remembers Laura taking notes at the side of the stage in Dunville Park during an anti-internment rally being addressed by Máire Drumm. And later Laura went to Dublin and worked for a time on An Phoblacht in Parnell Square. 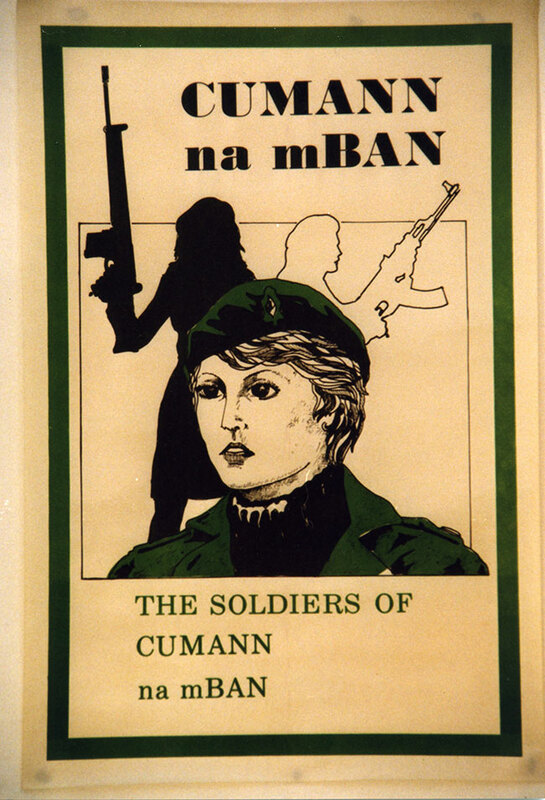 At some stage in 1973, Laura secretly joined Cumann na mBan. Few knew about it although one day Laura’s mother, Briege, when vacuuming the bedrooms found a blonde wig and put two and two together. Laura was ideal for certain operations. She had the demeanour of a professional young woman, drove her own car, and could confidently go places where most active service Volunteers back then would have stood out like sore thumbs. She dressed with class, clothes bought in the best boutiques, her face made-up with the most expensive cosmetics. Tragically, on the night of Monday 1 December 1975, a bomb they were transporting went off prematurely in a parked car in which Laura was the driver and Paul the passenger. That night there were a number of other IRA operations taking place across the city. Brenda recalls when the news came on about two people being killed her mother saying, “Lord have mercy on their souls,” without realising that one of them was her own daughter. The republican community in west Belfast was in mourning for these two brave comrades. Geraldine, who thought that the extent of Laura’s involvement was as a member of Sinn Féin, recalls the prison chaplain, Fr Raymond Murray, coming into Armagh Prison the following morning and breaking the news to her. She was given parole to attend the funeral. Laura’s coffin was laid out on her bed. On either side was a guard of honour. 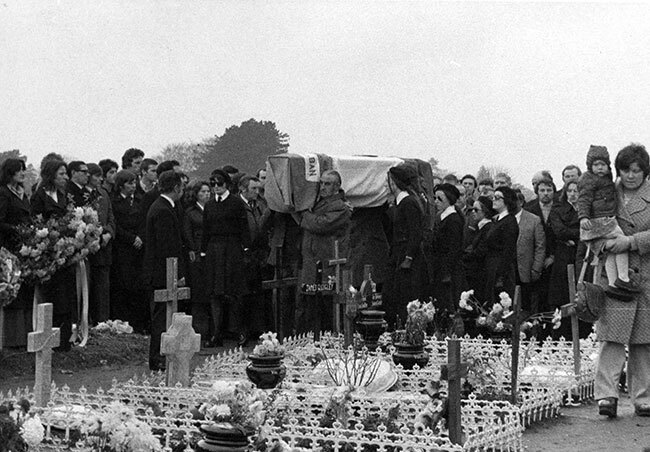 And marching among the guard of honour as the coffin was taken to Milltown was Geraldine. Outside Paul’s house, British soldiers stopped and jeered at the family. Just as his funeral was starting, the Brits tried to raid the wake but were prevented from doing so by dozens of women. Can you imagine those scenes on top of the grief that family and friends were experiencing? 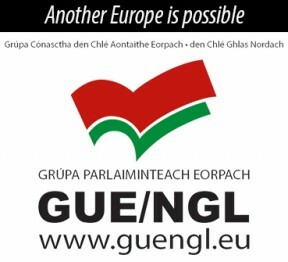 We are here tonight not to glorify or romanticise armed struggle and guerrilla war, because such actions involve tremendous sacrifice and struggle, heartache and pain. But nor do we baulk at the actions of our loved ones, our brothers and sisters and comrades who fought against overwhelming odds. They laid down their lives. We must speak about the story of their lives, the perils they undertook, so that we and our people and our children could be free.